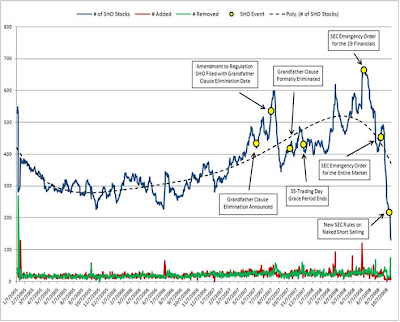 Below are two graphs of the number of stock suffering extended 'naked-short' selling, which is a good indicator of the level of activity in the securities lending industry. Dollar index - Notice how the dollar rallies as the treasury "failures to deliver" decrease. 1) Investors were buying treasuries last October because they believed the financial system was insolvent. How do you think they would react to knowing broker-dealers took their money and never bought treasuries? 2) While Treasury fails have declined substantially since the October 2008 peak, this is because central banks printed 2.5 trillion to allow prime brokers to settle their trades. This implies that the expansion in the central banks' balance sheet can never be undone. 3) There is nothing preventing broker-dealers from selling more treasury IOUs (or gold IOUs, stock IOUs, etc...) if they run into another cash flow problem. 4) Broker-Dealers would not have sold treasury IOUs if they had any other source of funding available. This confirms that they are truly insolvent and have virtually no cash on hand at all. 5) The US now owes over 1 trillion in foreign denominated debt, either directly through swap lines set up by the fed or indirectly via US financial institutions. The US can't print its way out of this debt. 6) The dollar rally was a onetime phenomenon, resulting in the inflow of money to settle these failed treasury trades. This entry was posted in Background_Info, Financial_Wizardry, Wall_Street_Meltdown. Bookmark the permalink. Good info Eric. 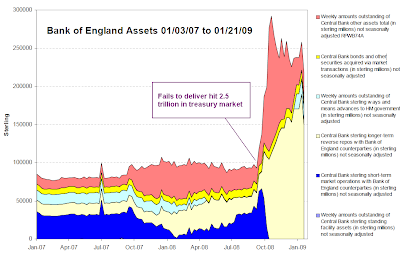 Questions; According to the very diagrams you posted, this Treasury fail issue has declined substantially since the sep 2008 peak. Could this be that the event is a non-issue? Secondly, Thanks again about your share entitlements info. Im trying to understand if what your saying is that effectively share entitlements is just a fancy word for book-entry form? I thank you in advance and keep up the great work. great presentation. Why is it that this information can not be used to open an investigation and hold those in an oversight role accountable?? Why can't a lawyer bring a class action suit against the SEC, or whomever allows this fraud? Your information is great...BUT ITS NOT BEING USED BY ANYONE FOR CONSTRUCTIVE PURPOSES. I guess that's the way the world is, and we will just live with it. 1) I take it you were not an owner of treasuries back in October of last year. If you were, I hardly think you could call this a "non-issue". Think about it, investors were buying treasuries last October because they believed the financial system was insolvent. How do you think they would react to knowing broker-dealers took their money and never bought treasuries? 2) While Treasury fails have "declined substantially since the sep 2008 peak", the key point is why. They declined because central banks printed 2.5 trillion and handed it over to broker-dealers to settle those fails to deliver. This implies that the expansion in the central banks' balance sheet can never be undone. 3) There is nothing preventing broker-dealers from selling more IOUs if they run into another cash flow problem. 4) Broker-Dealers would not have sold treasury IOUs if they had any other source of funding available. This confirms that they trully are insolvent and have virtually cash on hand at all. Thanks Eric for your reply to my question, that makes a lot of sense. I think your numbers should even be higherthough. Without taking too much time out of my Saturday morn I think about half a trill (a.k.a 500 Bill) is in hush hush, shoved-down-your-throat cross currency swaps. Some of them are to be unwound this fall... shall we say REFIRE? By the looks of things, anything that is outsource/external is uncontrolllable and goes up tremendously...while anything within source/internal drops like a bomb. This is not good. By December 2009, our markets will show their true colors to the public and they would not like it because it would definitely affect them(us). Eric, did you happen to read this on silver fraud? The article is based on BIS data, so relatively reliable as far as I believe. Eric, can you post a few examples of what will ( or can ) happen when the US Dollar falls into a abyss ? War?, worldwide panic?, food for gold?, a reset of all currencies, commodities and values? Thanks again for your eye-openers! Easy to understand and making a noise on Wallstreet! Keep you ugly words to yourself - they do not belong here. "mythical naked shorts"? It is fact. 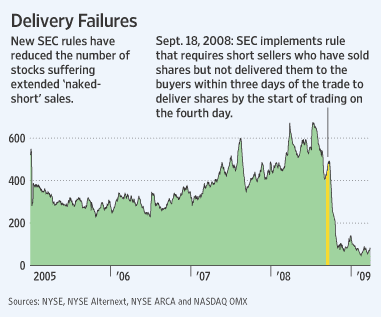 When a broker-dearler takes a clients money and then fails to settle the trade, this is naked short selling. 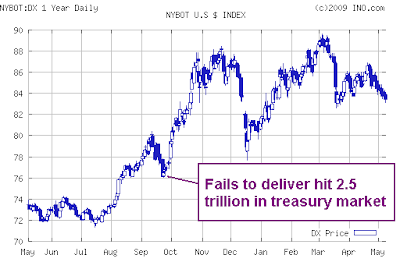 It is fact that broker-dearlers failed to deliver 2.5 trillion treasuries last October. What exactly "mythical" about it? Rather, it is you, as your logic and language suggest, who is greatly uninformed.